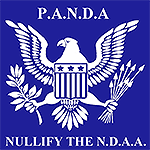 Letter from Dan Johson, founder of PANDA regarding NDAA resolution. On January 28th, PANDA Pennsylvania, members from groups such as the Susquehanna Valley Liberty Alliance, Oath Keepers, and the ACLU, along with several citizens from the city of Sunbury, approached the City of Sunbury, PA with legislation designed to interpose against Sections 1021 and 1022 of the 2012 National Defense Authorization Act (NDAA). Since the Council requested more information, PANDA National worked with our Pennsylvania team to ensure they were as informed as possible. Two weeks later, the Council was once again approached with the new information and a request to defend the right of the people of Sunbury. Mayor Persing however, seemingly backing away from previous statements, said he thought an ordinance was too harsh and requested a resolution. In light of the Mayor’s request, we worked as hard as possible drafting up a detailed, yet comprehensive, resolution to protect the rights of the people in your town. Yet, when the Council was approached a third time by PANDA Pennsylvania and other concerned citizens, we were met with a surprise. Without notifying the honorable councilmen who requested a strong resolution, Councilman Joe Bartello and Councilman Todd Snyder, the Mayor rammed a resolution through. It would be considered laughable were this not such a serious issue. citizens the unalienable rights guaranteed to us under the U.S. Passed this 25th day of February, 2013. We’re going to ask Congressman Barletta to do something. Acknowledging that one has taken an oath isn’t the same as keeping it. The people of Sunbury deserve a better NDAA resolution. The people of Pennsylvania deserve better NDAA legislation.